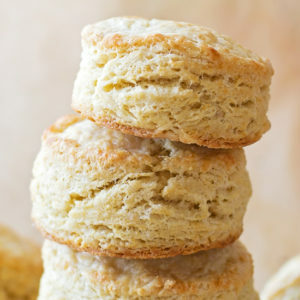 No one will believe that these tender, flaky, sky-high buttermilk biscuits are homemade! 6 ingredients & 20 minutes is all you need! Hop in the kitchen and make these ASAP!! No more tubes of pre-made biscuits people, no more! These are SOOO easy to make and only require a few simple ingredients. I totally thought that making scratch buttermilk biscuits was going to be some huge ordeal. It wasn’t. It took me 20 minutes start to finish. 20 minutes and I got a sheet full of these golden beauties!! Are you in? It all starts with mixture of all-purpose flour, sugar, salt and baking soda. Whisk it together then grab your butter out of the freezer. 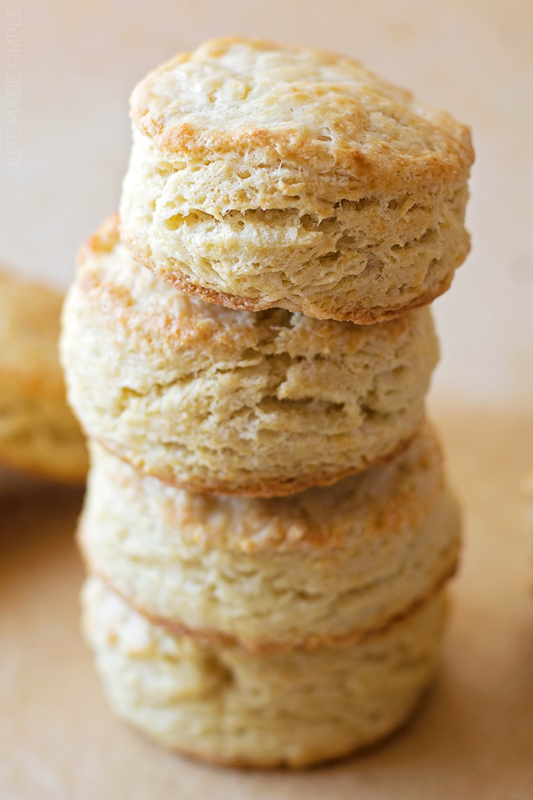 That’s right, frozen butter is what makes these biscuits ultra tender and flaky. Grate the butter (I use the big holes on my cheese grater) over the dry ingredients and then toss it together. No pastry cutter needed. Mix in the cold buttermilk and knead until a dough forms. Turn onto a lightly floured surface, roll or pat until the dough is about 3/4-inch thick and then using a round cutter make 12 biscuits. 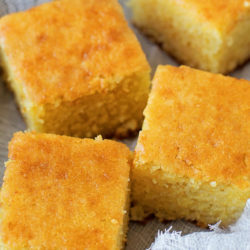 Place onto a lined baking sheet and lightly brush the tops with a little extra buttermilk. It’ll make the tops nice and shiny. Place into the oven and bake for 12-15 minutes or until golden brown on top. P.S. if you have a light on your oven it’s kind of fun to sit and watch these rise! 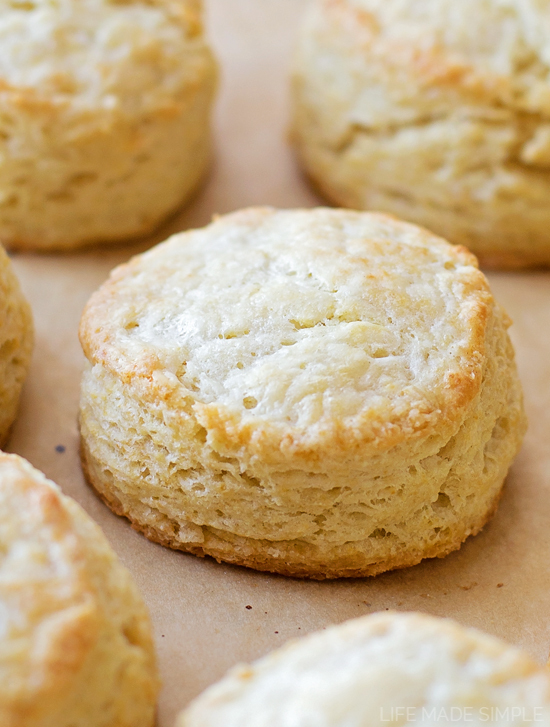 Enjoy these biscuits while they’re still nice and warm. We slathered ours with butter and homemade jam, and boy were they good! If you don’t want to make/eat them all in one sitting, you can easily freeze the rounds and pop them in the oven when you’re in the mood for freshly baked ones 🙂 I hope you’ll take the plunge and make your own buttermilk biscuits- they’re totally worth it! 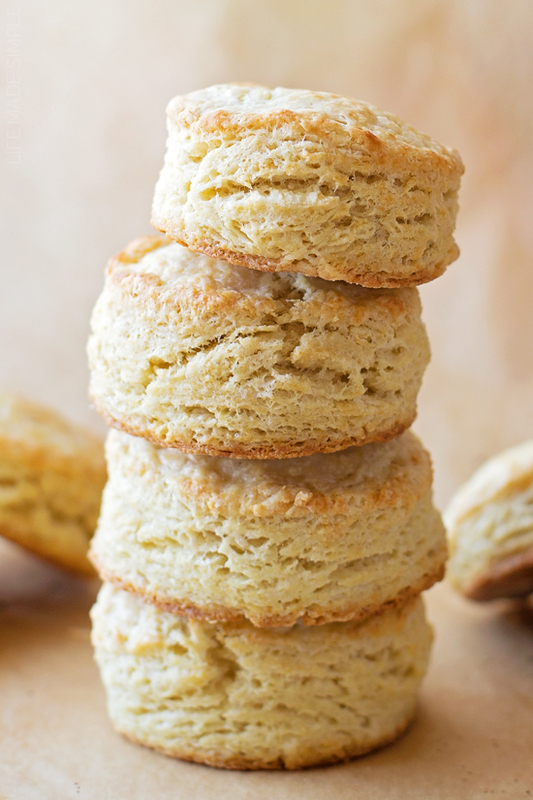 No one will believe that these tender, flaky, sky-high buttermilk biscuits are homemade! 6 ingredients & 20 minutes is all you need! Preheat oven to 400 degrees. Line a baking sheet with a baking mat or parchment paper; set aside. In a large mixing bowl whisk together the flour, sugar, salt and baking soda. Using a cheese grater, grate the butter over the bowl. Add the buttermilk and mix, then knead by hand for a minute or two until the dough just barely holds together. 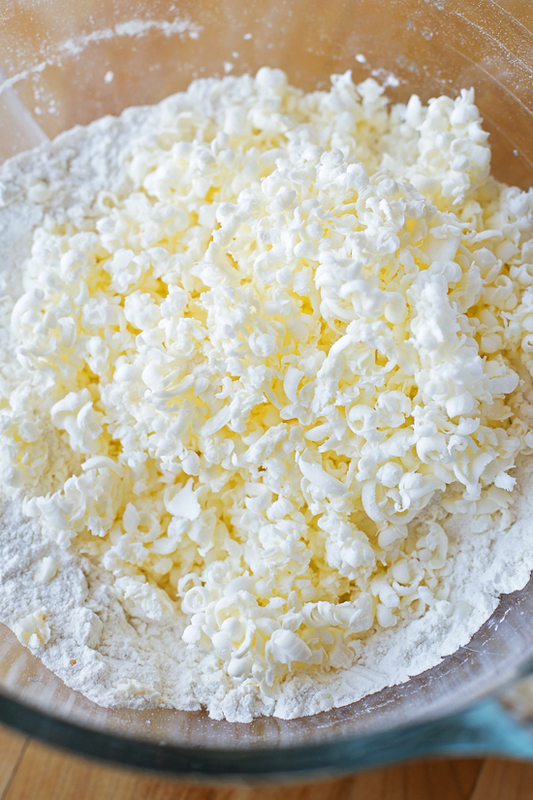 Transfer the dough to a lightly floured surface and pat or roll until ¾ inch thick (or slightly under). Using a round 2-3 inch cutter, press straight down and cut out 12 circles (re-rolling the dough if needed), DO NOT twist the cutter, it will destroy the flaky sides. Place on the prepared sheet at least an 1½ inches apart. Lightly brush tops with extra buttermilk. Bake for 12-15 minutes or until golden brown on top. Remove from the oven and serve warm. -If you don't want to make the biscuits all at once, you can cut them out and freeze them in an air-tight plastic bag for up to 3 months. 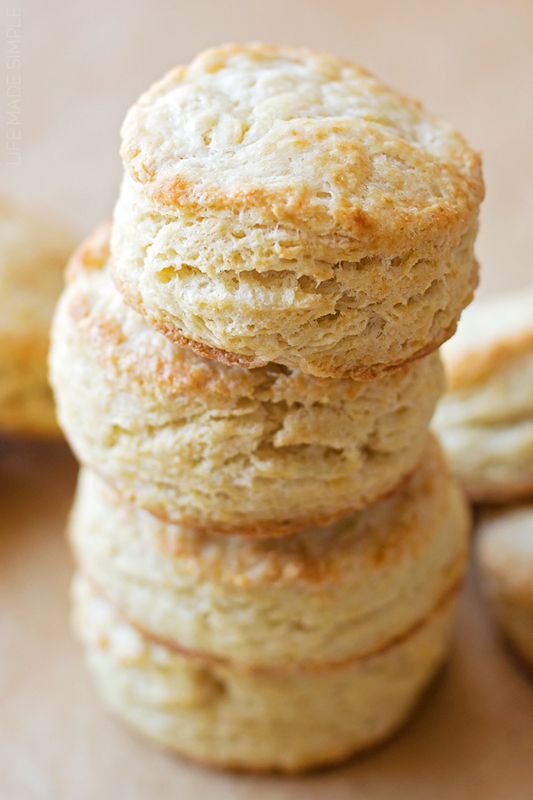 Remove them from the freezer, brush with buttermilk and bake for 2-3 minute more than the recipe states. oh yummy! 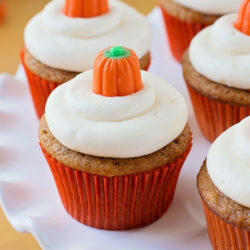 I’ll have to make these in the morning!! Oh my gosh! 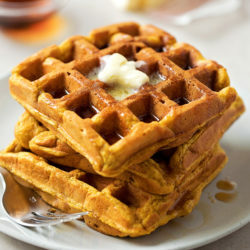 I made this recipe and used my new Presto waffle bowl maker. They came out AMAZING!! I have NEVER been able to make a biscuit!!! However, this recipe made my day. I can now make a biscuit!!! As it turned out, the cutter I have was larger than called for so I need to get a 2-3 inch one. I was so amazed at how easy this dough came together…that was after my hand thawed out after grating the butter. I truly think this made the real difference – can’t get butter any colder than frozen. Keep these great recipes coming!